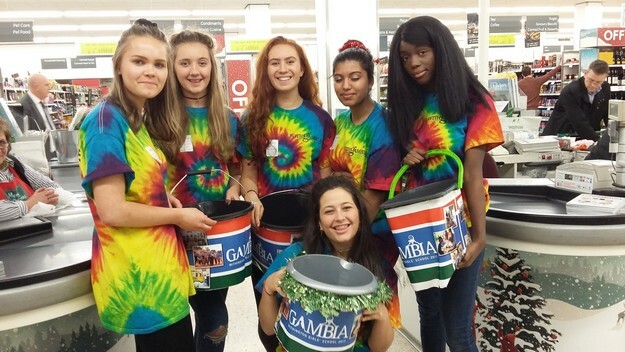 The Gambia Team 2017 have put in a brilliant effort fundraising which has raised in excess of £6000 since December 2016. Eleven members of the team raised £800 at Waitrose in Wilmslow in December 2016; Zenab H’s family kindly donated mobile phone cases and accessories which Zenab sold bringing in nearly £200. 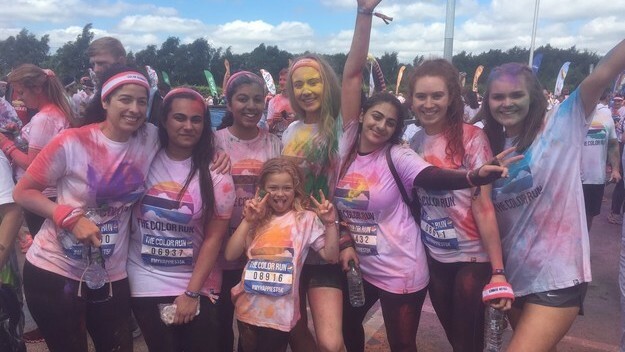 Claudia C set up a Just Giving page securing £700 in donations for the Manchester Colour Run in which Ruhaab, Zenab, Kate, Niamh, Mina, Miss Browning and Lola all took part. 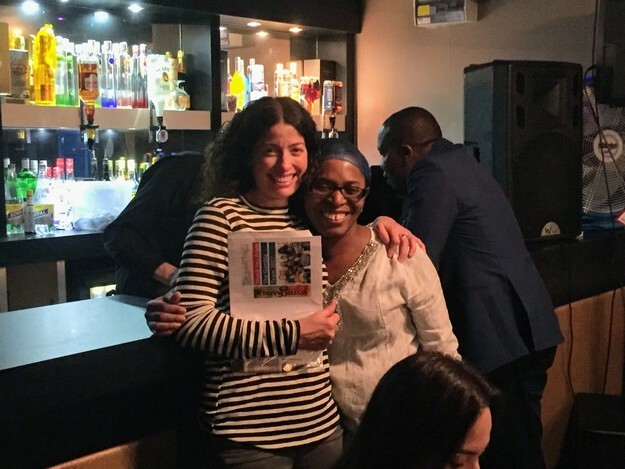 Eniola W organised a fantastic event at Roots Restaurant – the largest African restaurant in the North West. More than 50 guests were treated to fresh tastes and fragrant spices including some of Africa’s well-loved dishes including Jellof Rice, Tadjine and Boerewors. 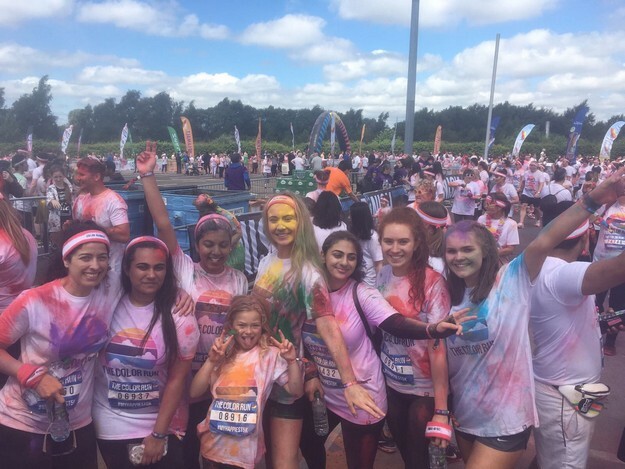 The whole team took part and raised £1700 including £600 worth of donations from Eniola’s friends and family. A big thank you to Eniola’s mum, Bim, for helping Eniola to coordinate this very successful event. Kate S and her sister Ciara (a former pupil now studying Medicine at Sheffield) made £700 through a family party as well as donations. A joint Promises Auction with the Uganda team secured over £2000 for each charity. DT Department staff, Fabiola Cotton and Katherine Cross, enlisted the help of younger girls to make cushion covers using material brought in The Gambia – we were commissioned by the school to replace cushions destroyed in the Hub flood – this raised £200. Chocolate tombolas, cake sales, truffle sales and raffles have been ongoing throughout the year. Under the supervision of our Project Manager Lamin Jammeh, funds raised this year a have enabled the construction of a new borehole to provide an independent water supply to Mama Tamba Nursery School. We also pay the salaries of the teachers so that the children attend free of charge. We also fund a feeding program for the school and support farming projects. The team will visit the school in December and help to upgrade the classrooms as well as teach the children aged from 3 years to 7 years. We are thrilled that former Headmistress Janet Pickering will be joining us this year. One of the best and easiest ways to help support our projects in The Gambia is to join the WithGambia Club and pay £5 per month by Standing Order and be in with the chance of winning a sizeable sum of money three times per year. If we get 100 members the prize fund would be £1000, so please do consider joining!